Our journey begins with a fictitious character whom we shall call [John Doe]. He represents the average professional worker who can be found in cities and towns across the world. Most everyday, [John] wakes up to his alarm clock and drives his car to work. He takes an elevator to his office and logs on to his computer. And he does these things without the slightest clue of how any of them work. While he may be interested in learning about the inner workings of the machines and devices he uses on a daily basis, [John] does not have the time and energy to invest in doing so. To him cars, elevators, computers and alarm clocks are completely different and complicated machines with hardly any similarities. It is simply not possible to understand how each of them work without years of study. The regular readers of Hackaday might see things a bit differently than our [John Doe]. They would know that the electric motor that moves the elevator is very similar to the alternator in his car. They would know that the PLC that controls the electric motor that moves the elevator is very similar to the computer he logs in to. They would know that on a fundamental level, the PLC, alarm clock and computer are all based on relatively simple transistor theory. What is a vast complicated mess to [John Doe] and the average person is nothing but the use of simple mechanical and electrical principles to the hacker. The complication resides in how those principles are applied. Abstracting the fundamental principles from complicated ideas allows us to simplify and understand them in a way that pays homage to Einstein’s off-the-cuff advice, quoted above. Many of you look at The Calculus the same way [John Doe] looks at machines. You see the same vast, complicated mess that would require a great deal of time and effort to understand. But what if I told you that calculus shares a commonality in much the same way many different machines do. That there are a few basic principles that anyone can understand, and once you do, it will unlock a new way of looking at the world and how it works. The average calculus course book is a thousand pages long. The [John Does] of the world will see a thousand difficult things to learn. The hacker, however, will see two basic principles and 998 examples of those principles. In this series of articles, I’m going to show you what these two principles – the derivative and the integral – are. Based on work done by Professor [Michael Starbird] of The University of Texas at Austin for The Teaching Company, we’ll use everyday examples that anyone can understand. The Calculus reveals a particular beauty of our world — a beauty that arises when you’re able to view it dynamically as opposed to statically. It is my hope to give you this view. Before we get started, it pays to understand a little of the history of how The Calculus came about, and how its roots lie in the very careful analysis of change and motion. 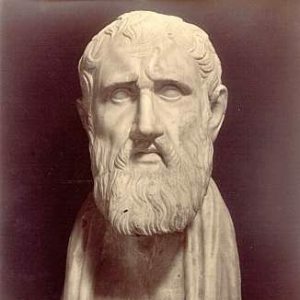 Zeno of Elea was a philosopher in the fourth century BC. He posed several subtle but profound paradoxes, two of which would eventually give rise to The Calculus. It would take over 2,000 years for man’s ingenuity to solve the paradoxes. As you can imagine, it wasn’t easy. The difficulties largely revolved around the idea of infinity. How do you deal with infinity from a mathematical perspective? Sir Isaac Newton and Gottfried Leibniz would go on to independently invent The Calculus in the mid 17th century, finally putting the paradoxes to rest. Let us take a close look at them and see what the fuss was all about. Consider the arrow flying through the air. We can say with reasonable and competent assurance that the arrow is in motion. Now consider the arrow at any given instant in time. The arrow is no longer in motion. It is at rest. But we know the arrow is in motion, how can it be at rest! This is the paradox. It might seem silly, but it’s a very challenging concept to deal with it from a mathematical point of view. We’ll find out later that what we’re really dealing with is the concept of an instantaneous rate of change, which we will elaborate on with the idea of one of the two principles of calculus – the derivative. It will allow us to calculate the velocity of the arrow at an instant in time – a monumental feat that took over two millennia for mankind to reach. Let us consider the same arrow again. This time let’s say the arrow is coming at us. Zeno says we don’t have to move, because it can never hit us. Imagine that as the arrow is in flight, it has to cover half the distance between the bow and the target. Once it reaches the half way point, it has to do this again – move half the distance between it and the target. Imagine that we keep doing this. The arrow is constantly moving halfway between its origin and target. By doing this, the arrow can never hit us! In real life, the arrow does eventually hit the target, leaving us with the paradox. As with the first paradox, we’ll see how to resolve this issue with one of the two principles of calculus – the integral. The integral allows us to deal with the concept of infinity as a mathematical function. It is an extremely powerful tool to scientists and engineers. The two main ideas of The Calculus will be demonstrated by using them to solve Zeno’s paradoxes. The Integral – The integral is a technique that will allow us to calculate the position of the arrow in the Dichotomy paradox. We will do this by looking at velocities of the arrow through incrementally smaller amounts of time, such that the precise position will be known when the time between measurements is infinitely small. It’s not difficult to notice some similarity between the derivative and integral. Both values are calculated by examining the arrow with increasingly finer time intervals. We will learn later that the integral and derivative are in fact two sides of the same ceramic capacitor. In this circuit, there is no current flow through the capacitor. The volt meter will read the battery voltage and the ammeter will read zero amps. So long as the potentiometer is not moved, the voltage on the meter will be steady. Our equation would say that i = C(0/dt) = 0 amps. 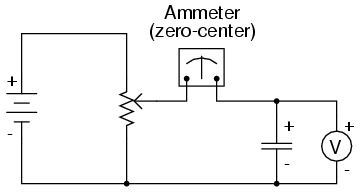 But what happens when we adjust the potentiometer? Our equation says there will be a resulting current flow in the capacitor. This current flow will be dependent on the rate the voltage changes, which is tied to how fast we move the potentiometer. These graphs show the casual relationships between the voltage across the capacitor, the current through the capacitor and the speed we turn the potentiometer. It starts with the potentiometer turning slowly. An increase in speed results in a faster changing voltage which in turn results in a dramatic increase in current. 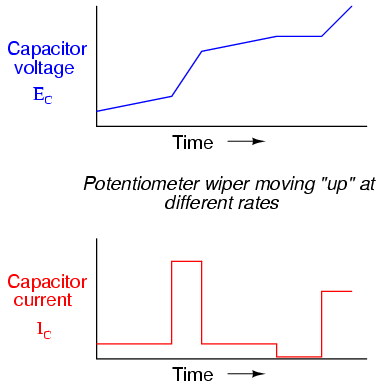 At all points, the current through the capacitor is proportional to the rate of change of the voltage across it. Calculus, or more specifically the derivative, gives us the ability to quantify this rate of change, so that we can know the exact value of current running through the capacitor at any given instant in time. The same way we can know the instantaneous velocity of Zeno’s arrow. It is an incredibly powerful tool to have in your hacking arsenal. In the next article, we will go into deep detail of how we calculate the derivative using a modern but still simple representation of Zeno’s “The Arrow” paradox and some basic algebra. A following article will do the same for the integral using the Dichotomy paradox. Then we will tie things up by showing how the two are related, something known as The Fundamental Theorem of Calculus.